Performance based design requires that a design team consider multiple factors simultaneously as they design a building. 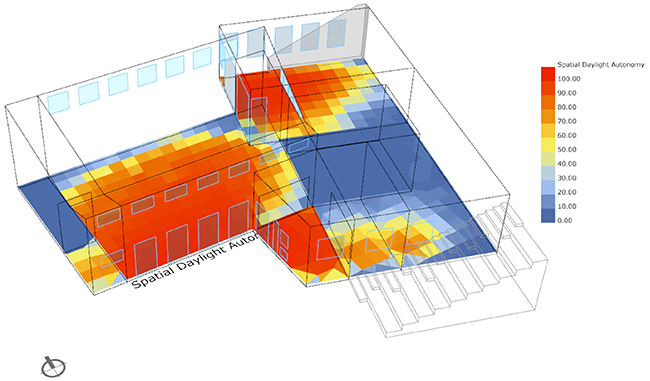 One of those factors is optimizing the building for daylighting. For Nuthatch the design team performed daylight analysis to help define both the form and orientation of the building and optimize window openings. We used the Honeybee extension for the Rhino plugin, Grasshopper to perform our analysis. Our building is composed of two volumes, the volume enclosed by the existing building foundation and another volume containing the multipurpose room. For the volume defined by the existing building we primarily used the software to analyze window openings, since the shape and orientation of the space was defined by the existing building footprint. For the multipurpose volume we were able to do a more extensive analysis looking at shape, location, orientation and window openings. 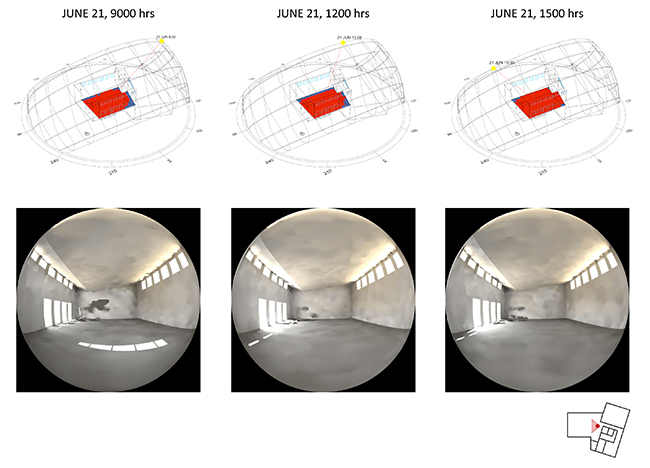 The software was used to consider three key factors: Spatial Daylight Autonomy; glare; and Occupant Adaptive Thermal Comfort. 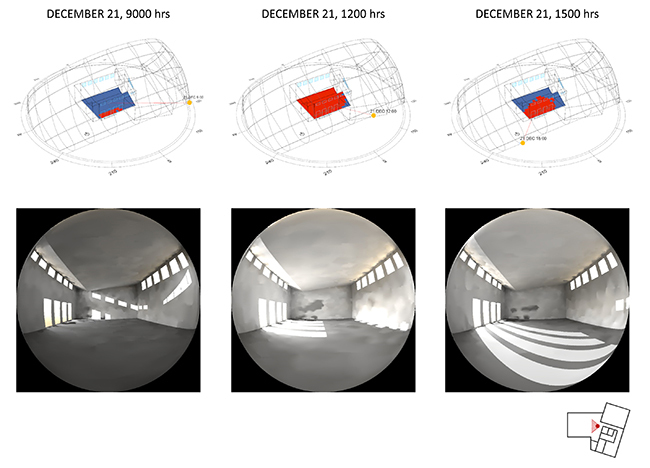 Spatial Daylight Autonomy looks at the normalized daylighting in a space over the course of a year allowing us to understand which approaches have the best overall daylighting. We then look at the space during specific times of day and year to make sure there are not issues with glare. 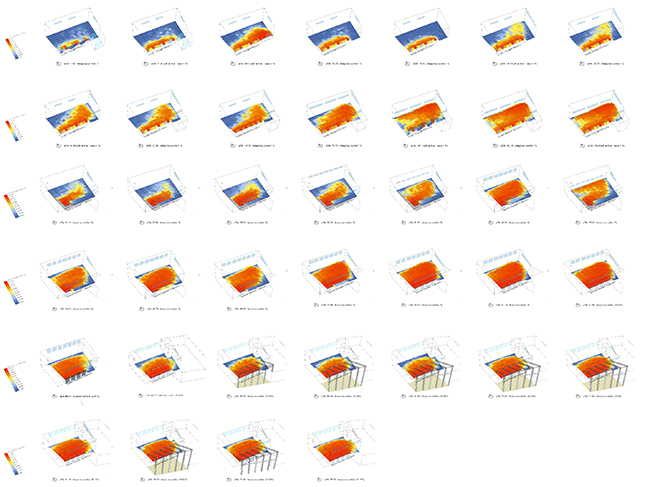 Finally, the Occupant Adaptive Thermal Comfort analysis uses ASHRAE Standard 55 thermal comfort model to show the relative comfort level in the space for each approach, which subsequently helps reduce the building energy consumption for heating and cooling. A great benefit of a tool like Honeybee is the ability to run hundreds of iterations to quickly refine and test our approaches. The images included with this post show some of those iterations along with the analysis of the scheme as it is at the end of Schematic Design. As we move forward with Design Development we will continue to refine our window placement and shading strategies and test them using this analysis tool. Nuthatch Hollow is an environmental learning and research site near the Binghamton University campus in Binghamton, New York. The Living Building Challenge is one of the most aspirational and rigorous building standards in the world today with only 11 buildings so far achieving full certification. The purpose of this project is to design and construct a Living Building Challenge Certified environmental classroom and research facility on the grounds of Nuthatch Hollow. The facility, about 2,000 to 2,500 square feet in size, will act as a hub for environmental classes and research within the broader Nuthatch preserve. At a symbolic level, the building will act as a physical manifestation of Binghamton University's core values and mission, especially as they relate to preparing students to live effectively in a time of change and helping them actively create a more sustainable, resilient world. The primary function of the facility will be for teaching and research for the Environmental Studies Program. In addition to this the facility will be available for other gatherings and may be used during the summer months for community based educational programs.